Carnivore? Omnivore? Herbivore? A Food Poll of a Different Sort - JP loves LIFE! The idea for this poll came to me because of a rather poignant comment by a reader. The comment, like so many other things I’ve read and heard in the past year, gave me reason to pause and consider things a bit differently. I have always loved meat. And while I’ve pointed out my granddad seemed to think he needed more meat and potatoes than I do, i have never given serious consideration to being a vegetarian. Now, that’s not to say I have an issue with anyone who chooses that diet. On the contrary, I say more power to them. It’s not just meat for me, I truly love cheese too. I also have to say that despite allergies, I’ve always enjoyed being around animals. The care pets receive and the care livestock receive is important to me. In the rare cases where I’ve seen mistreated animals (and I must say on some international trips it seemed far more common), my heart goes out to the animal and I would like to find a way to help. Growing up, I remember my sister donating her time at a local humane society here in Memphis. It’s really clear cause I remember the t-shirt volunteers got. It was a lot more recently when I learned that noble cause wasn’t a local part of the Humane Society of the United States. I’ve learned they have a lot of arguments with farmers — and not that they pick out a couple of bad ones in a bunch, they seem to paint a lot of farmers with the same brush about animal welfare. I don’t like that. I don’t know Lana other than through blog postings, etc so I’m not sure whether Lana and I agree on everything, but I know I clearly like to have meat and dairy as part of my diet. And I like my vegetables too, love fish too. I am an omnivore. I think a broad diet provides a valuable components for my health and I love the diversity of tastes. I also trust the vast majority of farmers go about their jobs diligently and thoughtfully. They respect the role they have in providing our food and I respect their dedication. While I was in the process of publishing this blog, I saw several friends mention http://choose2choose.com/ in their tweets. Good reminder that we may need to make choices and take action to provide for continued choices. Following is the comment on my blog that gave me the thoughts of doing this post. I’d like to put it out here in the public forum for discussion. Please note the concepts brought up in this are likely to encourage debate. I ask that all perspectives be treated with respect. We live on a family farm, and my husband farms 2,000 acres and raises feeder cattle with his father in northwest Indiana. I am extremely concerned about The Humane Society of the United States and their agenda to make our country a vegan one. I am totally fine with people choosing to not eat meat; it goes with our basic rights in this country. I am NOT fine with someone telling me I cannot eat meat or trying to pass laws that make eating meat produced by American farmer impossible or too expensive to afford. I think there are enough meat-eaters in this country to keep our jobs of raising meat safe, BUT this will only be true if these people who choose to eat meat stand up for themselves and the farmers who responsibly raise this food staple. If we remain the silent majority, the very well financed, loud minority will pass laws under our noses that make eating pork, chicken, and beef impossible. Look at California, Michigan, and now Ohio. This is not a state issue any more; it is an issue of national concern. I am curious to hear what other people think of this situation and, more importantly, what organizations, groups, and individuals are doing to protect the rights of farmers in other communities throughout our nation. What do you think? Is a specific agenda beginning to drive food policy? What action do you think is appropriate if any? « Birthday Greetings & Barnyard Noises Make a Return; I Can Moo, Can You? I agree with the writer that we have to be concerned when a well funded minority wants to force their thinking on the rest of us. I have been extremely concerned about the HSUS effort to paint all dairy farmers as abusinve because one very, very sick man was so abusive. I am also quite disappointed that the videographer was not charged as an accomplice. 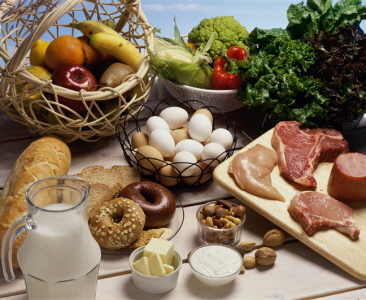 As a nurse, we do need the balanced diet to obtain the variety of nutrients we need. Vitamin B12 is essential and obtained from animals. Fiber is also essential and generally from fruits and vegetables. Calcium and vitamin D also key from dairy products. What we eat is always a political statement, whether we are aware of it or not. And although I certainly eat meat (in fact, meat from animals I raised, slaughtered, and butchered), I do think that Americans on average eat too much meat. “Too much” from a variety of perspectives, including from the perspective of nutrition, hunger issues, and ecological issues. You really don’t have a clue how much feed and water it takes to produce meat until you have carried it yourself to your animals. Of course, farm animals play an important role in the ecology of small, organic farms, so their presence is certainly not only justifiable but necessary. They not only provide meat, eggs, and dairy, but they also consume what might otherwise be considered waste, convert things that are otherwise inedible (grass, for example) to usable protein, and produce fertilizer for the garden. So, although i do not share the Humane Society’s goal of converting us all to vegans, I do think that us meat-eaters need to cut back some on how much meat we consume. I agree. You’ve obviously learned a lot from producing your own food. I am lucky enough to see some of that but there are millions who have no exposure to what it takes to produce the food they eat. As far as cutting back on meat consumption, I agree a lot of people eat too much meat and I’ve personally certainly reduced the amount of meat I eat and increased fruit and vegetable consumption. It was the eating of meat that brought man’s ancestors out of the trees and fire that made him what he is today. You can survive eating only fruits and veggies, but your brain needs 20 times the energy that muscle does. To get that you need cooked food, and meat as part of that diet will help feed your brain. You will find that groups like the Farm Bureau, Cattle Producers, Pork Producers and many others are very concerned about HSUS and other groups like them. Most farm groups are encouraging their members to get involved in social media. We are encouraged to speak out and tell our story. If we do not tell that story, someone else will tell a story about us that we may not like. It’s time for all involved in telling agriculture’s story. If not us, who? If not now, when? Great example of taking action in a positive way! Whatever environmental or ethical consequences come from eating animals will soon increase exponentially as millions and millions of poor people in countries like China climb into the middle class and start buying meat. Personally, I like the model of spending my meat budget on quality while decreasing quantity – but I don’t know if the average human would trade their daily industrial chicken/ground beef for a more politically-correct weekly meal. Understand. And I’m lucky enough to have sufficient budget to make those choices too. Not sure everyone does. HSUS is a major problem but so are other AR groups. They are a major threat to ranchers all the way down to pet owners. It has gotten to the point where I wonder if it isn’t already too late. Our government officials on the local, state and federal levels seem to have bought into it. Too many people see the commercials of sick cow or a sick little puppy and their mind says all animals are treated this way and they send in their check. They get ballot initiatives by using propaganda words and phrases, such as “You do want to stop puppy mills.” “You don’t want to see cows sick and dying slaughtered for human consumption.” “These pigs spend their entire lives where they can’t even lie down.” “You want animals treated humanely.” Etc. etc. and of course people think yeah I’m for animals being treating humanely, I’m against animal abuse. Of course we all are, but what people don’t understand is that is not what these regulations are about. If you ask these same people are you willing to stop people breeding dogs and cats or getting all cats and dogs neutered if it means in 20 years there will be no dogs and cats, they would never be for that. If you ask people are you willing to pay $8 a carton for eggs in order for all chickens to be free range, the majority would be against that. Are you willing to pay $10 for a carton of milk, etc. But this is not explained to people, just the propaganda is all they hear. They don’t even know what these regulations mean or if they even have anything to do with what is better for the animals. They just don’t want to be for animal abuse. Our states are giving these people basically police powers, look at Texas or Florida, they run around in uniforms that look as close to police uniforms as possible. They raid farms, homes, etc. and many times even law enforcement believe they’re government agencies and have the authority and go along with what they say. The fact is too many people have no clue what it takes to get their food in those nice little plastic wrapped packages in their supermarket. They don’t have the first clue how to raise farm animals. They don’t understand the animals are these farmers, ranchers livelihood, not taking the best care possible of their animals means destroying their livelihood. Somehow the facts have got to be put out there, but I honestly don’t know how. These are groups with tons of money going against farmers, breeders, ranchers, etc. without anywhere near the money to fight with. They are the minority, but they’re a well funded minority because they have fooled the majority. Agri-business doesn’t have any money to lobby their legislatures? This is just silly. Humane organizations are dwarfed by the lobbying power of corporations making billions each year. The problem is that most people disagree with you and want animals to be treated humanely and not kept in cages where they can’t turn around or move. We all know that what is done to animals on CAFO’s is wrong. We’re not fooled by anyone. Our laws have not kept up with the rest of the world for the last 30 years and it’s time that they did. This will not destroy agribusiness, as other countries with these reforms have survived just as we will. It’s never just one bad apple, it is an industry run amok. People who want to save the industry should be fighting for the moderate reforms that are sweeping the country not wasting money, effort, and the good will of the people fighting sensible regulations. I am raising the question about food & diet as a personal one and asking about personal action. Just my two cents. I love just about every kind of food and my philosphy is pretty much if it is not moving quick enough to get off the plate before the next bite it is fair game. I do have those occasional days when for whatever reason I eat mostly or even all vegetables but then I also have those days when I am probably overboard on the meat side of things. Bottom line is that it should always be a choice. I do find a lot of the commercials that are coming from the HSUS and similar organization a bit unfair and definitely disturbing given they take one case and seem to suggest all are that way. On the other hand, I also find it disturbing that a lot of times as farmers we will know of a situation and let it be without a seeming care. Perhaps a bit of self policing would go a long way toward keeping some the bad press out of there. As for me personally though, I have been involved in pasture raised pork before and more then willing to pay a bit extra to know the stock had a healthy environment prior to getting on my plate. Making nutritional choices (how much, what, when, where) is about taking personal responsibility. There is a difference between allowing me to make my own choices or forcing a decrease in the choices I can make. I would like to continue to choose to include meat in my diet or not….without having to justify my decision. The animal rights agenda is pressing more than people realize. One of the biggest reasons I’ve been interested in the Agvocacy 2.0 trip is bringing out things happening that people do not know. The slaughter of rabbits being a means of cruelty accusations and media smears. (Done). The raising of $50k to import, spay/neuter 1000 rabbits to TX for ‘sanctuary’ so they don’t get killed. (Yes…in progress). Why they succeed…not just HSUS. They succeed (mentioned in a recent blog) because they’re willing to pool money and action to come up with $50k (from an anti fur campaign) because it’s also media worthy and gets more donations. And because the general population aren’t really concerned about food as long as it’s on the shelf. It doesn’t matter what people say – it’s what they do. And action says the majority of Americans really don’t care enough to engage. I hope to help change that. We need to change that! Love the blog & poll. To be fair- some people don’t like the texture of meat. At least that’s what they say to me… I think we should encourage some vegetarians to follow Janice’s blog and get their point of view.